It’s been well established that I am not even ready to talk about thinking about getting ready for Christmas. But. Maybe you are? Good for you. And the good news is you’re not a lone, as lots of folks are already getting into the Christmas spirit. Recently I spied this cute — and totally simple — snowflake hat on the Yarnspirations site. It’s knit flat in stockinette stitch, has minimal shaping, and the snowflake is worked in duplicate stitch once the knitting is done. Easy peasy and a great way to add some holiday to your wardrobe without knitting a holiday jumper. Not that there’s anything wrong with holiday jumpers. And Kat at Just Crafty Enough knit up a little scalloped trim that because a super cute Christmas tree ornament. I love the little beads and think this would be awesome in a bigger version as a decoration for the table or the mantlepiece. 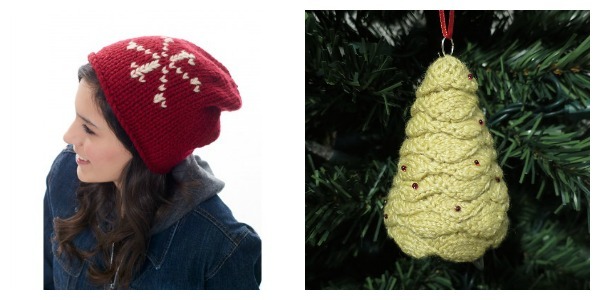 Are you thinking about holiday knitting yet? I’d love to know what you’re working on.